Fighting giraffes (Giraffa camelopardalis) in Ithala Game Reserve, Northern KwaZulu Natal, South Africa. Bones of right fore feet of existing Artiodactyla. From left to right: Pig (Sus scrofa), Red deer (Cervus elaphus), and Camel (Camelus bactrianus). U = ulna, R = radius, c = cuneiform, l = lunar, s = Scaphoid, u = Unciform, m = Magnum, td = Trapezoid. 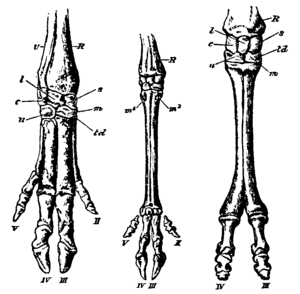 In the Sheep and the Camel, the long compound bone, supporting the two main (or only) toes is the cannon bone. Even-toed ungulate is the common name for any of the hoofed, mostly herbivorous, terrestrial mammals comprising the order Artiodactyla, characterized by a double-pulley astragalus (a bone in the ankle joint) and an even number of functional toes (two or four), with the main limb axis passing between the middle two digits. Artiodactyls include such well-known members as pigs, peccaries, hippopotamuses, camels, chevrotains (mouse deers), deer, giraffes, pronghorns, antelopes, sheep, goats, and cattle. Artiodactyla is one of two living orders of ungulates (hoofed mammals), the other being Perissodactyla, the odd-toed ungulates. With more than 220 species, artiodactyls are the most abundant large land mammals living today. They also are of great nutritional, economic, and cultural importance to humans, and in particular the domestic species are highly sought for such functions as food, fur, milk, fertilizer, medicinal products, and as draught animals. And wild species such as antelopes and deer provide both food and sports hunting, in addition to adding to the wonder of nature. Ecologically, the wild artiodactyls provide important roles in terrestrial food chains. A symbiotic relationship with microorganisms and a long digestive tract, with multiple stomach chambers, allows most even-toed ungulates to have an exclusively herbivorous diet, digesting plant matter (such as cellulose) that otherwise would provide little nutrition. The microorganisms also provide protein for the ungulates, while in turn the microbes receive a habitat and continuous supply of plant matter to digest. The ungulates, or hoofed mammals, are divided into two living orders, Artiodactyla, the even-toed ungulates, and Perissodactyla, the odd-toed ungulates. As evident by the names of the orders—Artiodactyla comes from the Greek artios, meaning "even numbered" or "entire" and dactylos, meaning finger or toe, and Perrissodactyla from the Greek perissos, meaning "odd" and dactylos—the two groups are primarily distinguished by the feet (Shackleton and Harestad 2004). All artiodactyls have an even number of functional toes, either two or four, on each foot (although there is conflicting information regarding the number of toes in the hind feet of a few species of peccaries in the Tayassuidae family) (Shackleton and Harestad 2004). The symmetry of the foot passes between the middle two digits. In those artiodactyls with two main toes, the weight is borne on these two central elements, while the other toes are either reduced, vestigial, or absent, and when present are called dew claws or lateral hooves. In those artiodactyls with four weight-bearing (functional) toes, the toes form a spreading foot, with the nails at the end of the toes often enlarged. This is in contrast with the perissodactyls where the weight is born mostly or entirely by the middle toe. Another key distinguishing feature is the shape of the astragalus. The astragalus is a tarsal (ankle) bone in the hind limb. It has deeply arched grooves where it articulates with the limb bones on either side (grooved joints). These grooves help in resisting lateral motion and also creates a double-pulley system that gives the foot greater flexibility and additionally increases the springiness of the lower hind limb (Savage and Long 1986; Shackleton and Harestad 2004). The double-pulley astragalus is a key feature in identifying artiodactyls in the fossil record (Shackleton and Harestad 2004). While artiodactyls are the most abundant large land mammals today (Shackleton and Harestad 2004), there also are some small members. The mouse deer (Tragulidae family) of Southeast Asia stand no more than 35 centimeters (14 inches) at the shoulder and weigh less than one kilogram (two pounds). On the other hand, the largest member of the order, the common hippopotamus (Hippopotmus amphibius) reaches 4500 kilograms (10,000 pounds). Artiodactyls vary greatly in form, with some with very long necks and other short; some with long faces and other short; some with a straight back, others with the front shoulders raised higher than the rump, and others with the rump higher than the shoulders; a tail that may be very short to long; and legs that may be long or short and slender to quite stout (Shackleton and Harestad 2004). Female artiodactyls have two to four teats, but members of the Suidae family have six to twelve teats (Shackleton and Harestad 2004). Almost all species have some sort of weapons, whether unbranched horns, forked horns, antlers, or well-developed canines or tusks. These typically are largest in males and smaller or absent in females. The pelage consists of longer, stout guard hairs and shorter, normally finer underfur, although domestic sheep commonly have been bread so they lack the guard hairs, with the underfur providing wool (Shackleton and Harestad 2004). Artiodactyls traditionally have been placed into the three suborders of Suiformes, Tylopoda, and Ruminantia. The Suiformes classically have contained the three extant families of Suidae (pigs), Tayassuidae (peccaries and javelinas) and Hippopotamindae (hippopotamuses), although the hippos in many current taxonomies are placed in their own suborder of Cetancodonta. The only extant group in the Tylopoda is the family Camelidae (camels, llamas, and other camelids). The suborder Ruminantia contains the true ruminants, which are the extant families Giraffidae (giraffe and okapi), Cervidae (deer), Tragulidae (mouse deer and chevrotains), Antilocapridae (pronghorn), and Bovidae (antelopes, cattle, sheep, goats) (Shackleton and Harestad 2004). The group's suborders differ in various characteristics. Suina (pigs and peccaries) have retained four toes of fairly equal size, have simpler molars, short legs, and often have enlarged canine teeth that form tusks. Camelids and Ruminantia tend to be longer-legged, to walk on only the central two toes (though the outer two may survive as rarely-used dew-claws) and to have more complex cheek teeth well-suited to grinding up tough grasses. Artiodactyls all have one or more digestive chambers located before the true stomach (abomasum). Most members of the suborder Ruminantia have a four-chambered stomach, with the four chambers being the rumen, reticulum, omasum, and abomasum. This suborder includes such ruminating mammals as cattle, goats, sheep, giraffes, American Bison, European bison, yaks, water buffalo, deer, wildebeest, antelope, pronghorn, and nilgai. However, the chevrotains (family Tragulidae) within Ruminantia have a three-chambered stomach. Likewise, members of the suborder Tylopoda (camels, alpacas, llamas) have a three-chambered stomach. Note, all of these animals are still considered "ruminants," even though the camelids are not part of Ruminantia. This is because the term ruminant simply means any even-toed ungulate that digests its food in two steps, first by softening it within the animal's first stomach, known as the rumen, then regurgitating the semi-digested mass, now known as cud, and chewing it again. Therefore, the term "ruminant" is not synonymous with Ruminantia. An alternative name for ruminants is "foregut fermentors," because bacterial fermentation takes place in the rumen, which is the first and largest chamber (Shackleton and Harestad 2004). The pigs and peccaries have only one small chamber before the abomasum, and hippos (like the camelids and tragulids) have two chambers before the true stomach. While hippopotamuses have a three-chambered stomach, they do not ruminate. They consume grass during the night and may cover large distances (up to 20 miles) to feed. They eat around 68 kg of food each night, also relying on microbes to break down plant material with cellulase. Most species within Suina have a simple two-chambered stomach that allows an omnivorous diet; the babirusa, however, is a herbivore (Janis and Jarman 1984). They have extra maxillary teeth to allow proper mastication of plant material. Most of the fermentation occurs in the caecum with the help of cellulolytic microorganisms. Peccaries however have a complex stomach that contains four compartments (Shively et al. 1985). Microbial fermentation with the formation of high volatile fatty acid levels has been observed in the fore stomach. It has been proposed that their complex fore stomach is a means to slow digestive passage and increase digestive efficiency (Shively et al. 1985). In the ruminants (Ruminantia and Tylopoda), food is regurgitated and rechewed then broken down by microbes in the stomach. After ingestion of plant material it is mixed with saliva in the rumen and reticulum and separates into layers of solid and liquid material. The solids lump together to form a bolus (also known as the cud), this is regurgitated by reticular contractions while the glottis is closed. When the bolus enters the mouth, the fluid is squeezed out with the tongue and reswallowed. The bolus is chewed slowly to completely mix it with saliva and to break down the particle size. Ingested food passes to the 'fermentation chamber' (rumen and reticulum) where it is kept in continual motion by rhythmic contractions of this organ. Cellulytic microbes (bacteria, protozoa, and fungi) produce cellulase, which is needed to break down the cellulose found in plant material. Without this mutual symbiosis ruminants would find plant material indigestible (Janis and Jarman 1984). Not only are ruminants dependent on microorganisms for digesting cellulose, but the microorganisms also are the main protein source, with the ruminants digesting the microbes. Even-toed ungulates are found on every continent but Antarctica; they were introduced to Australia and New Zealand by humans (Pough et al. 1979). While not native to the oceanic islands, domestic species have been introduced to many small remote islands. Artiodactyls inhabit most ecosystems from arctic tundra to tropical forest, including deserts, valley floors, and mountaintops. Artiodactyls are generally gregarious animals, living in groups, even if the groups are limited to two or three members. However, the sexes tend to remain separate, with adult males living apart from females and young (Shackleton and Harestad 2004). Most artiodactyls are obligate herbivores that rely on plant matter for their diet. However, members of the Suidae and Tayassuidae are omnivores. And there are records of other artiodactyls occasionally eating the eggs and young of ground-nesting birds and other animal protein (Shackleton and Harestad 2004). The ancestors of the even-toed ungulates were believed to be omnivores that preferred plant material. Members of the Suidae give birth to between four and eight young, with domestic pigs giving birth to more than 12 piglets per litter. However, other artiodactyls generally give birth to one, sometimes two young a year. All artiodactyl young are precocial, able to walk within hours after birth. One male mating with several females is the most common mating system, but temporary mating pairs may form and in a few species these mated pairs can stay together much of the year (Shackleton and Harestad 2004). The even-toed ungulates are of great historical and present economic and cultural value. They served as large mammal prey for early hunters. Cro-Magnons relied heavily on reindeer for food, skins, tools and weapons; with dropping temperatures and increased reindeer numbers at the end of the Pleistocene, they became the prey of choice. By around 12,500 years ago, reindeer remains accounted for 94 percent of bones and teeth found in a cave above the Céou River (UW 2003). Today, many species of even-toed ungulates are still hunted for food and sport (deer, antelopes, African buffalo, wild sheep, etc.). In addition, the most important domestic livestock are artiodactyls, including cattle, goats, sheep, pigs, and camels. Sheep and goats likely were the first animals to be domesticated after the dog, perhaps 8,000 to 9,000 years ago (Shackleton and Harestad 2004). Cattle today are the basis of a multi-billion dollar industry worldwide. The international trade in beef for 2000 was over $30 billion and represented only 23 percent of world beef production (Clay 2004). Artiodactyls, both wild and domesticated, are used to provide meat, fur, milk, fertilizer, medicinal products, bones, antlers, horns, and serve as beasts of burden. As with many mammal groups, even-toed ungulates first appeared during the Early Eocene (about 54 million years ago). In form they were rather like today's chevrotains: small, short-legged creatures that ate leaves and the soft parts of plants. By the Late Eocene (46 million years ago), the three modern suborders had already developed: Suina (the pig group); Tylopoda (the camel group); and Ruminantia (the goat and cattle group). Nevertheless, artiodactyls were far from dominant at that time: the odd-toed ungulates (ancestors of today's horses and rhinos) were much more successful and far more numerous. Even-toed ungulates survived in niche roles, usually occupying marginal habitats, and it is presumably at that time that they developed their complex digestive systems, which allowed them to survive on lower-grade food. The appearance of grasses during the Eocene and their subsequent spread during the Miocene (about 20 million years ago) saw a major change: grasses are very difficult to eat and the even-toed ungulates with their highly-developed stomachs were better able to adapt to this coarse, low-nutrition diet, and soon replaced the odd-toed ungulates as the dominant terrestrial herbivores. Now-extinct Artiodactyla that developed during the Miocene include the species Ampelomeryx, Tauromeryx, Triceromeryx, and others. Cetaceans are conisdered to have arisen from artiodactyls, and an early whale from 47-million year old Eocene deposits was found to have a double-pulley astragalus (Shackleton and Harestad 2004). In some taxonomies, the cetaceans and even-toed ungulates have been placed together in Cetartiodactyla as sister groups, although DNA analysis has shown cetaceans evolved from within Artiodactyla. The most recent theory into the origins of hippopotamidae suggests that hippos and whales shared a common semi-aquatic ancestor that branched off from other artiodactyls around 60 million years ago (UCB 2005; Gatesy 1997). This hypothesized ancestral group likely split into two branches around 54 million years ago (Ursing and Arnason 1998). One branch would evolve into cetaceans, possibly beginning with the proto-whale Pakicetus from 52 million years ago with other early whale ancestors collectively known as Archaeoceti, which eventually underwent aquatic adaptation into the completely aquatic cetaceans (Boisserie et al. 2005). The following classification uses systematics laid out by McKenna and Bell (1997) and the extant families recognized by Mammal Species of the World published in 2005 (Wilson and Reeder 2005). Boisserie, J.-R., F. Lihoreau, and M. Brunet. 2005. The position of Hippopotamidae within Cetartiodactyla Proceedings of the National Academy of Sciences 102(5): 1537–1541. PMID 15677331. Retrieved February 4, 2009. Clay, J. 2004. World Agriculture and the Environment: A Commodity-by-Commodity Guide to Impacts and Practices. Washington, D.C.: Island Press. ISBN 1559633700. Gatesy, J. 1997. More DNA support for a Cetacea/Hippopotamidae clade: The blood-clotting protein gene gamma-fibrinogen Molecular Biology and Evolution 14: 537-543. Retrieved February 5, 2009. Janis, C., and P. Jarman. 1984. Artiodactyla. In D. W. Macdonald, ed., The Encyclopedia of Mammals. New York: Facts on File. ISBN 0871968711. McKenna, M.C., and S.K. Bell. 1997. Classification of Mammals Above the Species Level. New York: Columbia University Press. ISBN 0231110138. Pough, F.H., C.M. Janis, and J.B. Heiser. 2005. Vertebrate Life, 7th edition. Upper Saddle River, N.J.: Pearson/Prentice Hall. ISBN 0131453106. Savage, R. J. G., and M.R. Long. 1986. Mammal Evolution: An Illustrated Guide. New York: Facts on File. ISBN 081601194X. Shackleton, D.M., and A.A. Harestad. 2004. Artiodactyla. In B. Grzimek, D.G. Kleiman, V. Geist, and M.C. McDade, Grzimek's Animal Life Encyclopedia. Detroit: Thomson-Gale, 2004. ISBN 0307394913. Shively, C.L., et al. 1985. Some aspects of the nutritional biology of the collared peccary. The Journal of Wildlife Management 49(3): 729–732. University of California at Berkeley (UCB). 2005. Scientists find missing link between the dolphin, whale and its closest relative, the hippo Daily Science News January 25, 2005. Retrieved February 5, 2009. University Of Washington (UW). 2003. Bones from French cave show neanderthals, cro-magnon hunted same prey ScienceDaily September 23, 2003. Retrieved February 5, 2009. Ursing, B.M., and U. Arnason. 1998. Analyses of mitochondrial genomes strongly support a hippopotamus-whale clade Proceedings of the Royal Society 265(1412): 2251. Retrieved February 4, 2009. Wilson, D.E., and D.M. Reeder. 2005. Mammal Species of the World, 3rd edition. Johns Hopkins University Press. ISBN 0801882214. This page was last modified on 29 January 2011, at 21:19.